A year after threatening the unity of Spain with an attempt to declare independence, the former Catalan president Carles Puigdemont launched a new party on Saturday, as he tries to rally separatists from his base in Belgium. The new group, named ‘The Call’ (full name, ‘Crida Nacional per la República‘ (the ‘National Call for the Republic’) held a founding congress on Saturday evening, marking the one year anniversary of the secession push, but it has struggled to attract a groundswell of support, with some allies languishing in Spanish jails and others choosing a more moderate political path. The meeting of Puigdemont’s party on Saturday was held in the pro-independence town of Manresa, in the centre of Catalonia, near to the prison where the independence leaders are being held. 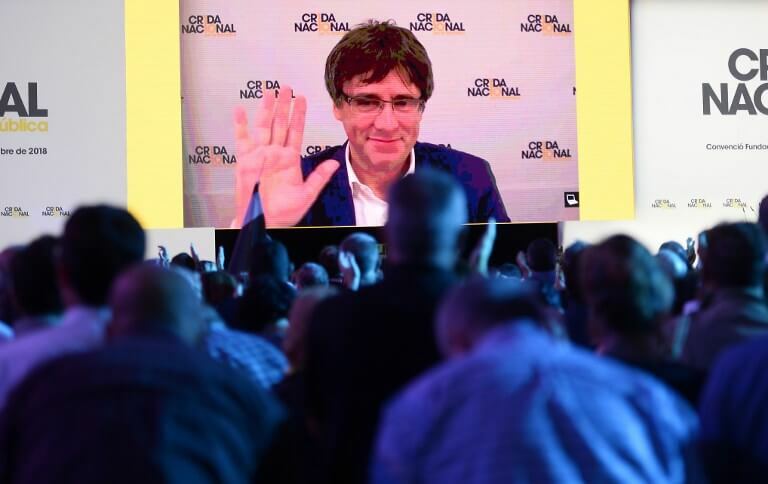 ‘A year ago we decided that we would continue the fight, whatever the conditions and circumstances, and that we would commit ourselves to building a better country, a republic,’ said Puigdemont in Brussels of the new party. In a speech relayed on a giant screen to his supporters, he alluded to divisions within the separatist camp, insisting on ‘moving forward united’ rather than apportioning the blame. However many of his former allies who have adopted more moderate and pragmatic positions have refused to join the new party. The independence declaration threw Spain into political turmoil, with the central government ousting Puigdemont, who then fled to Belgium, dissolving parliament and imposing direct control over the wealthy northeastern region. Snap polls in December saw separatist parties once again win an absolute majority in the regional parliament. But Torra, who regularly seeks counsel from Puigdemont, presides over a Catalan government divided between those who back disobedience to advance the cause of independence and those who favour dialogue with new Spanish Prime Minister Pedro Sánchez. The trial of 18 former Catalan leaders over their role in the separatist push, expected to start in early 2019, helps to keep the separatist camp mobilised. Several dozen activists from the powerful grassroots separatist organisation ANC (Catalan National Assembly), which has previously staged massive pro-independence street protests in Barcelona, gathered at the city’s regional administration offices early Saturday to demand the official publication of the independence declaration. ‘This anniversary is quite bittersweet, a day of great hope that did not materialise,’ said ANC president Elisenda Paluzie. Later, more radical elements rallied in front of the regional government building, berating Torra for his cautious approach But their numbers never swelled beyond 200. Madrid continues to refuse to allow any referendum on self-determination in Catalonia, despite Sanchez’s reliance on Catalan separatist parties to pass legislation. This has helped further fracture the independence movement. Puigdemont is due to present a ‘Council of the Republic‘ – a sort of Catalan government in exile in Belgium – in the coming days aiming to rally support for a continued independence push. ‘We are not talking about a dream, we are talking about a reality, we are talking about the Catalan Republic,’ says a TV clip for the new party.